The phrase "long-awaited album" might well have been coined for this one, Wonder's first LP in 26 months. It is a phenomenal undertaking, two disks and a four-song EP bonus record, a 24-page booklet of lyrics and Wondermessages. But what of the music itself? The songs, all 22 of them, are as warm and sunny as a beautiful dawn in some unspoiled forest. The album is a gorgeous communication from a genius soul at peace with itself. This is Wonder at his smoothest and most romantic, with excitingly pounding multi-keyboard solos that give way to sky-soaring melodies and the most expressive singing ever put on record by Wonder. Best cuts: "I Am Singing," "Isn't She Lovely," "Love Is In Need Of Love Today," "Sir Duke," "I Wish," "Black Man," "Ebony Eyes," "Another Star." This double got off to the most successful start in the history of the US album chart. It debuted at number one, a feat previously achieved only by Elton John's Captain Fantastic and the Brown Dirt Cowboy and Rock of the Westies. It stayed there for fourteen weeks, a longer time than those two precedent-setters combined. Songs in the Key of Life spun off two number one singles, "I Wish" and "Sir Duke." The latter, a tribute to Duke Ellington, also gave name checks to Count Basie, Glenn Miller and "Satchmo" (Louis Armstrong). One outstanding track that did not become a single was "Isn't She Lovely." This song honoured the birth of Wonder's daughter and featured her early cries. The artist maintained that to edit such a work for single release would be to compromise both purpose and effect, and he resisted public demand for a 45. In Britain a cover version by David Parton reached the top five, but Stevie's remains the requested version. Prior to the release of Songs, Wonder had signed his fourth recording contract with Tamla. It was at the time the most expensive deal in history. Perhaps more importantly, it allowed Stevie to determine his own release schedule. After having issued six albums in thirty-nine months, nearly one every half year, the artist went silent for two years. The lyric sheet on Songs, a volume in itself, acknowledged public anxiety for new Wonder product with the words, "Thank you everyone for being so patient." No one could have been disappointed: there is more music in this set than in any of the other Top 100 LPs in our survey, and much of it outstanding. One track, "Village Ghetto Land," was co-written by Stevie and Gary Byrd, who himself later had a Motown success with "The Crown." In 1987, Songs in the Key of Life was chosen by a panel of rock critics and music broadcasters as the #14 rock album of all time. - Paul Gambaccini, The Top 100 Rock 'n' Roll Albums of All Time, Harmony Books, 1987. As the title suggests, Wonder gets down to the political, religious and philosophical here. But where other artists would have turned out cliché Wonder manages to divert naïvety into real sincerity. Melodically the album is much more daring though never letting slip or losing sight of its basic rhythmic beat. Bettering even his previous albums, Wonder received Album of the Year (1976), Best Pop Vocal (Male) and Producer of the Year (1976) Grammy awards for this double album, which also held the US No. 1 slot for 12 weeks. It marked a creative peak for Wonder as producer, songwriter and performer; a peak which he has shown little inclination to leave over a decade on! Musically the flavours and colours have changed little but now are under the stronger jazz influence from the likes of contributing musicians Herbie Hancock and George Benson. The individually packed CDs, each with its own booklet, sound more refined than the earlier albums on CD but once or twice there are occasions when the sound closes up into distortion, especially in harmony vocals. In general the sound is both vivid and strong, though bass in tracks like "I Wish" does not have the muscle and fluidity that one could hope for and associates with the Compact Disc medium. - Rob Bowman, Musichound Rock: The Essential Album Guide, 1996. - Gary Graff, Musichound Rock: The Essential Album Guide, 1996. - Zagat Survey Music Guide - 1,000 Top Albums of All Time, 2003. A sprawling twenty-one song collection, Songs in the Key of Life would become the definitive Stevie Wonder album, one that demonstrated a master at his peak. Accomodated over the course of two LPs and a bonus EP, the blind maestro swerved between pop and politics with a deft hand that demonstrated his immense skill as a songwriter and performer. "Love's in Need of Love Today" and "Village Ghetto Land" echoed Marvin Gaye's soul searching sentiments of What's Going On, while "Black Man" tackled the inequities and ironies of racism in America. Somewhat ironically, it was the lighter fare, in the form of "Sir Duke," a tribute to the great Duke Ellington, and "I Wish," a reminiscing ode to innocent childhood days gone by, that helped Stevie score the biggest chart hits. 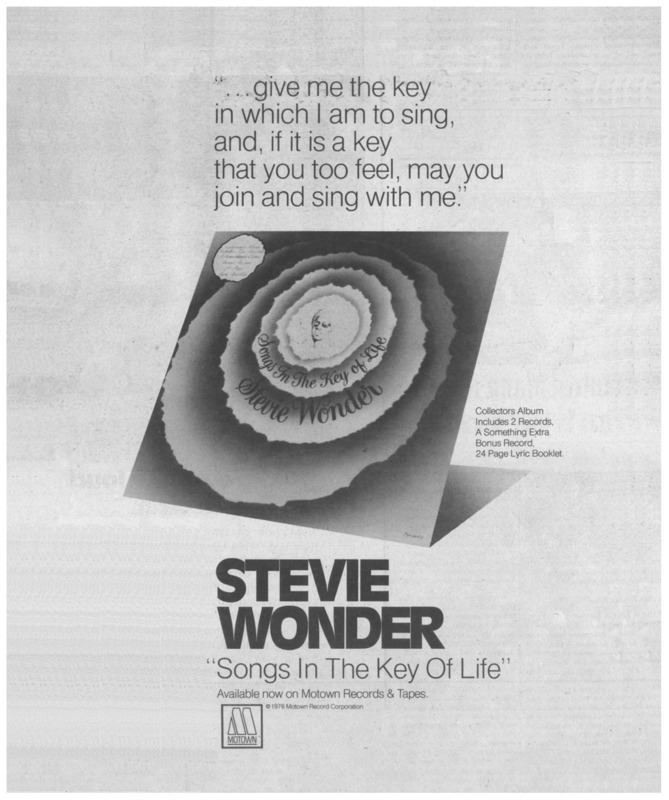 In retrospect, however, Songs in the Key of Life will always be remembered as an album, not just the packaging of a few hit singles, and that's what Wonder wanted. Songs in the Key of Life was voted the 7th greatest album of all time in a VH1 poll of over 700 musicians, songwriters, disc jockeys, radio programmers, and critics in 2003. - Nevin Martell, VH1's 100 Greatest Albums, 2003. Making this record, Wonder would often stay in the studio forty-eight hours straight, not eating or sleeping, while everyone around him struggled to keep up. "If my flow is goin', I keep on until I peak," he said. The flow went so well, Wonder released twenty-one songs, packaged as a double album and a bonus EP. The highlights are the joyful "Isn't She Lovely" and "Sir Duke," but Wonder also displays his effortless mastery of funk, jazz, balladry, Afrobeat and even a string-quartet minuet. Nineteen years later, Coolio turned the haunting groove of the quiet "Pastime Paradise" into the Number One single "Gangster's Paradise." Songs in the Key of Life was chosen as the 56th greatest album of all time by the editors of Rolling Stone magazine in Dec. 2003. Stevie Wonder kept bosses at his label Motown waiting two years for Songs In The Key Of Life, but their patience was rewarded by the most ambitious project he had yet conceived. Having recorded six albums of original material in just over three years, Wonder took his time crafting this wide-ranging set, spread across two discs and an accompanying four-track EP. At this career point the artist could afford to take his time -- six months before the album's release he had signed a seven-year, $13 million new deal with his record company, then the biggest in recording history. The album became the first by a US artist to debut at Number One on the Hot 100, while delivering chart-topping singles in "Sir Duke," Wonder's uplifting tribute to Ellington, and the punchy "I Wish." With 14 weeks in the top slot, the album also combined the gentleness of "Love's In Need Of Love Today" and the social awareenss of "Black Man" and "Village Ghetto Land." "Isn't She Lovely," which Wonder refused to edit from its six and a half minutes for single release, honoured the birth of his daughter and even contained her early cries. 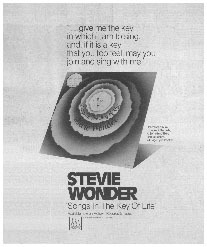 As of 2004, Songs In The Key Of Life was the #14 best-selling album of the 70s. On August 15, 1975, Stevie Wonder signed a $13 million contract with Motown, guaranteeing complete artistic freedom. He had stockpiled hundreds of songs, but the ensuing months saw him record 200 more, forcing Motown to clear the decks for the first of two double albums that propelled him from precocious maverick to international megastar (it was one of the first albums to enter the U.S. chart at No. 1). At times it is close to jazz: "Sir Duke" is a big-band celebration of Duke Ellington, "Confusion" is a jazz-rock instrumental in the vein of the Mahavishnu Orchestra. The samba-tinged "As" features Herbie Hancock, the salsa-flavored "Another Star" boasts flautist Bobbi Humphrey and guitarist George Benson, and the blended heavenly "If It's Magic" is a duet with harpist Dorothy Ashby. New songs constantly delayed the album. "There were times when he'd stay in the studio 48 hours straight," recalled bassist Nathan Watts. "You couldn't even get the cat to stop and eat!" Indeed, the CD's final four tracks initially came as a bonus, 33rpm seven-inch. Songs... was much lauded, though Robert Christgau of the Village Voice thought it riddled with New Age baloney ("Saturn"), didactic lectures ("Black Man"), and soupy sentimentality ("Isn't She Lovely"). Nonetheless, it set the tone for Stevie's Rainbow Coalition politics -- the booklet thanks Jesse Jackson and Louis Farrakhan alongside Frank Zappa and Andy Williams. - John Lewis, 1001 Albums You Must Hear Before You Die, 2005. Originally released as two LPs with a bonus seven-inch EP, Stevie Wonder's 106-minute 1976 opus, Songs in the Key of Life, is the crowning achievement of Seventies pop's grand aspirations. Early in the decade, Wonder demanded creative control from his label, Motown, and the result was a string of smash LPs -- 1972's Talking Book, 1973's Innervisions and 1974's Fulfillingness' First Finale. Only twenty-six years old, Wonder slowed his flow of hits to negotiate a $13 million contract and then made good on the deal with Songs, his most ambitious and successful album ever. - Barry Walters, Rolling Stone, 6/2/05. Consider what it takes for a blind recording artist to capture ideas in the studio. There are the usual problems of positioning oneself correctly at an instrument, and the challenges of positioning oneself correctly at an instrument, and the challenges of keeping a constant distance to the microphone -- quality takes can be ruined by a simple turn of the head. Then there is the not-small problem of lyrics. On this, his magnum opus, Stevie Wonder sang most of the lead vocals just after hearing the lines spoken into his headphones. Think about that the next time you hear any of these twenty-one incandescent songs, which include one of the all-time funkiest looks back at childhood ("I Wish") and a prayer for the ages ("Love's in Need of Love Today") and a bursting-with-life samba ("Another Star"). Wonder sings all of them in an unbroken spirit stream, even though every few seconds he's being prompted with the next line in his ear. Miraculously, he's not thrown by this. He wriggles and tumbles through the lines as though he's riding river rapids. Nothing about these vocals -- nothing -- feels premeditated. When he began work on Songs, Wonder had issued five albums, all classics, in the preceding thirty-nine months. He made a public decision to slow down for this collection; the musicians involved recall that in addition to spending time refining each track, Wonder kept writing (and in some cases recording) right up until the mixing sessions. The final product, which took two years to complete, contains seventeen thoughtful and undeniable songs originally issued on two vinyl records (plus a four-song "somthing's extra"). There is no filler. - Tom Moon, 1,000 Recordings To Hear Before You Die, 2008.